I have always loved the little towel animal creations you find in your room during cruises. 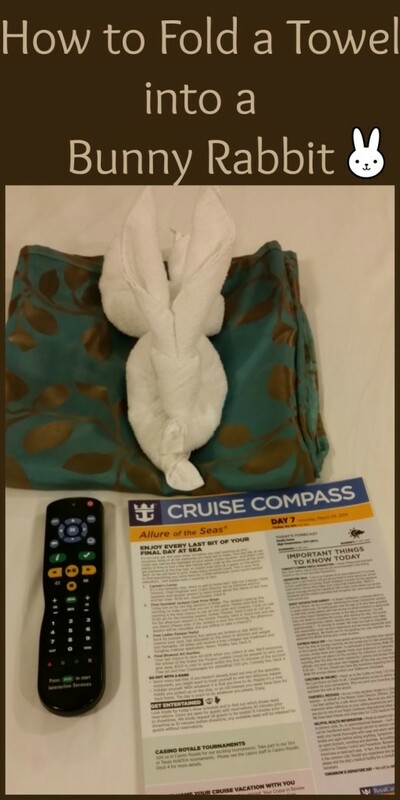 On our recent trip on Royal Caribbeans Allure of the Seas I attended a class on how to fold towel animals. I grabbed some quick video of the towel folding class so that I wouldn’t forget. Here is a snippet of the class that teaches how to fold a towel into a bunny rabbit. I thought this would be adorable for Easter this Sunday. For an even cuter look, put some sun glasses on your towel rabbit! I know the video is shot at sort of a weird angle but the one thing you need to know is that the big towel starts off being rolled in opposite decorations and meet in the middle to create the two separate “tubes”. Then he folds those in half towards each other, pulling the corners to somewhat fold it out of itself. Does that make sense? You can see him do it really well when the kid struggles. If this one is difficult for you, I personally happen to think this bunny is adorable and has great directions. Did you have fun? OK, do me a favor and pin the image below so that you can teach your friends how to fold a towel into a bunny rabbit and make them a hero this Easter too.